If you also forgot your SBI ATM / Debit card PIN, you can get your PIN online instantly. No need to visit bank or ATM. The 4 digit ATM PIN number should be changed periodically but sometimes we forget this pin. If you enter wrong PIN for three times, the card will be blocked for a day. Now State bank of India gives you online facility to create your new pin online instantly without visiting branch for physical PIN or ATM. If you also forgot you SBI ATM / debit card PIN then follow this step by step process and create your new pin instantly. 2: After logging in, you have to click on e-Services — ATM Card Services. 3:In ATM Card Services, you have to click on ATM PIN Generation. 5: In next screen, select your account number and click on continue. 6: Now you have to select your ATM card and submit it. 7: Now you have to enter first two digits of your desired PIN. Enter two digits and submit. 8: Now in the next screen you have to enter your 4-digit PIN number. Insert the first 2-digit that you entered in the previous step and then enter the last 2-digit that you received via SMS. In this way enter 4 -digit PIN and submit it. That’s it, you have successfully set your new PIN and now you can use this PIN. So whenever you forgot your SBI ATM debit card pin, set your new pin online instantly without visiting branch or ATM. You can also follow same process if your card is new and physical PIN is not received. 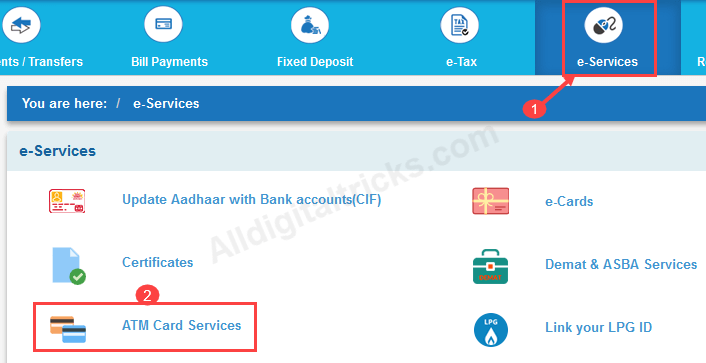 How to activate new SBI ATM/debit card online? How to apply new SBI ATM/debit card online? Profile password is second security password for authentication any transaction. Can I Register My Mobile Number With Internet Banking Online….? No. You can not register your mobile number online but you can change it online. To register your mobile number visit branch. And Sir One More Thing…. Can I Use Internet Banking And Mobile Banking Without ATM Debit Card…..?? Yes you can use SBI Anywhere mobile banking. Just need registered mobile number to activate it. After activation you can use it for balance check, fund transfer and more. For net banking activation you need debit card.